We hope our Frequently Asked Questions section will help answer anything you may be worried or wondering about. What is a Homecoming Mum? 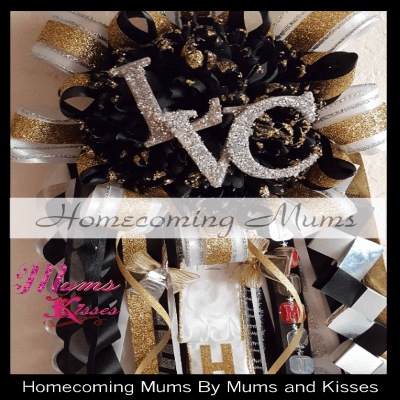 A: A Homecoming Mum is a Tradition in Texas that dates back to the 1930’s and as far back as the 1910’s in Missouri, through the years has gotten bigger and expanded to other parts of the U.S. The tradition is that the bigger the mum, the more loved you are by the one who gave it to you. Males wear the mum garter and the ladies wear the pinned mums. 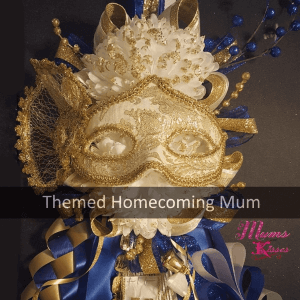 Read more about what a Homecoming Mum is HERE..
Do I get photo updates of my order in process? A: No Photos Please – If you are nervous or VERY VERY particular about your order it’s best to call us and request an appointment with the owner to talk about your mum before ordering. We can do this in store or via phone. We will work with you on your mum order until you’re happy that we understand your vision. But please do not ask us to send you photos of your product in process. This takes a lot of time for the amount of orders we handle. It sounds simple to snap a photo and send it to your phone, but this can lead to an hour long text session about what is being done. We always feel a little like a sonogram before the baby comes, it’s nice but you don’t really see what you’re getting till it’s there. Like most things that are ordered, it’s better to trust the company you hire. Since we ship our mums we can be everywhere! But we our store is located just outside Fort Worth in Crowley Texas. And yes you can come in and see our work as well as buy your own supplies to make your mums yourself If you’d like. Why should I choose Mums and Kisses? A: We have a couple of things going for us. 1st we keep our prices lower than most can make their own mum because we work directly with manufacturers and distributors. We do not buy our supplies over seas or at a hobby shop so we are able to keep our costs lower than most for you! We also have a very professional and secure website that most mum professionals can not duplicate. We personally feel if their website looks basic, how great will their products turn out? And how secure would we feel giving our personal info to them. The owner of Mums and Kisses has had her personal information stolen online and never wants anyone else to experience the upset of online fraud, that’s why she insists that we use the highest level of website protection! Mums and Kisses also offers coupons and discounts as well as high quality, creativity. It’s our sole focus all year long! How do you ship these things? We are the pioneers of mum shipping! One of the first to ship mums in bulk. Customers are amazed that we can ship mums, and a LOT of them. over 85% of our orders are shipped, even in the same town! Whether we’re shipping to you across town, across the state or across the country, we will ship the same way! To answer the question of how we ship, the simple answer would be FLAT! No not flat rate shipping…. we mean the mum is laid out flat, It’s laying down in it’s own box and secured so it will not move. This way you get it the way we made it. No folding! We make our mums out of satin, they don’t crease like acetate would. But just the same, we like it FLAT! Can I place my order in person? A: No we require payment when placing the order. 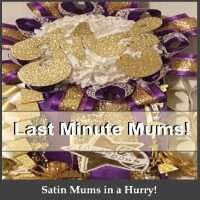 Is it better to order a mum from the designer mums or build my own? A: Depends on what you want. The designer mums have everything you need and for most freshmen and sophomores they’re awesome! But for those upperclassmen or those that have seen it done by an older sibling, they want more and the build your own, is MORE in both creation and in cost. 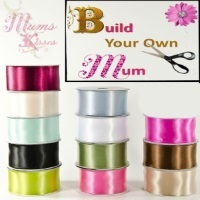 If you want your mum specific and as custom as can be, then build your own is the way to go! What happens if something I ordered goes out of stock? A: This rarely happens because of our close relationship with our manufacturer. BUT, if we are back ordered or out of stock of an item we will substitute product that will be an upgraded product than you probably ordered. We feel it’s our fault if we don’t have something you asked for so if we have something better we’ll automatically use it. If we can’t substitute an item, we will contact you. A: Please see our Cancellation & Refunds page. If I order by this date, will I get my mum in time? A: Our ordering system is set to accept only orders we can make and ship in time. We have an on time rate of 100% That’s no joke. We have jumped through hoops to make sure that our customers aren’t let down. We keep saying we have kids too, we do! We wouldn’t let them down if we can help it. We will go above and beyond to make sure it gets there in time BUT… we can’t control everything. We will bust it to do our part but once it leaves us, it’s in the hands of the chosen shipping carrier and God. In all the years we’ve been doing this, including shipping mums through Hurricane Harvey, we’ve done it! But there really is no guarantee, please know that. If you’re going to order 3-4 days before your homecoming, you are taking the risk of the off chance that it won’t make it. But you do have our promise that we always do our very best to make sure you get your order by your need by date. When I check my order it still says order is processing, what does that mean? A: If your order is marked “in processing” That’s a good thing! It means that we’re making your item, it is on our cutting table are actively working on it. Stage 1: When you originally make your order your status is considered “pending”. And you receive an email confirmation. Step 2: When your order has been received internally a work order will be issued to make your product(s) and the status will change to “order is processing”. This is where we are actively making your mum. this does NOT mean your order paper work is processing, it means we’re making your order. Step 3: Your order status will stay in processing until it reaches the “Finishing Touches” stage. In the finishing touches status you will receive an email updating you that your products are being steam cleaned, quality controlled, documented and packaged (the quickest part of the process). Step4: After this stage your order will be changed to “order complete”. You will receive an email stating your order is now complete. This does NOT mean it has shipped yet and the email will NOT contain tracking information yet. Unfortunately our system is too detailed for that. Step 5: After your order is complete it is waiting to be shipped or picked up. For Shipping – When the carrier collects the package, your item status is now changed to “Order Shipped” At the “order shipped” stage, you will receive an email with a tracking number. Feel free to log into your account to track your order status. We use package tracking so you will literally be able to see exactly where your order is every step of the way, even where it is in transit! I need a mum tomorrow! Can You help? A: Sometimes we can. However for example if it’s Thursday, and your homecoming is Friday as in tomorrow, if your order needs to shipped to be worn to school tomorrow, and we ship it today, you will not receive it in time, even if we ship over night. The delivery service will most likely deliver while you’re in school. If you live with in distance to visit our shop we can help you get a mum today. No problem. A: Sure! See our Deals Page for all our discounts and specials. Please note to the codes are CASE SENSITIVE. they only work with NO spaces. The checkout is the best place to enter the codes as some have reported that not all web browsers allow the code on the cart page. I’m running out of time, and I don't live near you, Can you do a Rush order and ship it? A: Yes! See our RUSH ORDERS page to answer this question the best. Me and my boyfriend broke up and his name is going to be on my mum because I ordered the mum before we broke up, what can I do? A: There are many fish in the sea! And rest assured, we can fix the order for you. Fill out the order change form or call us at 817-518-9000. If your order has shipped. We can no longer change your order BUT, you’re welcome to take the scissors and chop his ribbon off! I’m not 18, can I use my parents credit card to order? A: If you have their permission, yes. My shipping address is different than my billing address, can I still place an order? A: Yes, please indicate this at checkout. Do I HAVE to have an account to place and order? A: As of Nov 2017 we do now require each customer to make an account. We require this because of the over whelming calls requesting the status of orders. Now we offer order tracking and to track orders one must have an account. A: We accept credit cards or debit cards with Visa, American Express, Discover, or Paypal, Pay by check via PayPal. Is my information safe with your website? A: As safe as we can make it! We use Square and Paypal to process credit and debit payments, the safest method we offer. Our credit card section is encrypted and we pay extra to have sitelock (the padlock at the top of the browser) with SSL Cert to make sure your information is safe. Mums and Kisses does not hold your credit Card information on file, ever! anytime by logging into your account to check the status. Can I come and see your homecoming mums before I order? A: Sure you can! Our shop is located in Crowley, Texas right outside of Fort Worth. If you’d like to come and see what you’re getting before you place your order we have many of our designs on display. We also sell our custom supplies in store as well. What if I am not happy with my order? What then? A: We do our very best to make each mum a masterpiece! If for some reason you are not happy with it, please see our cancellation and refund page.